Windows® MultiPoint Server 2011 is the second version of a Windows product primarily Designed for educational institutions that allows multiple users to simultaneously share one computer. Users have their own independent and familiar Windows computing experience, using their own monitor, keyboard and mouse directly connected to the host computer. 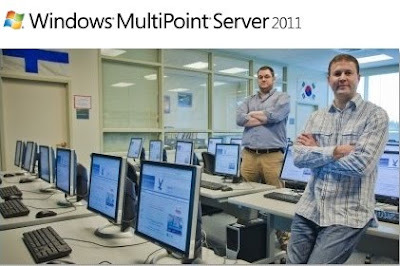 Windows MultiPoint Server 2011 enables more users to access technology at a lower total cost of ownership. Designed for non-technical users, it is simple to manage and use. Unlike other similar solutions on the MARKET, Windows MultiPoint Server 2011 is based on the latest Windows technology and thus can run Windows applications. Support can be obtained through Microsoft or an authorized partner, and schools have access to its full capabilities, the latest updates, and the confidence that they are getting the experience they expect. Now RDP-compatible Network clients, including legacy PCs, conventional thin clients, LapTops, and netBooks can be repurposed into MultiPoint stations, and connect to the MultiPoint Server over your Network. Thin clients with support for RemoteFX technologies enjoy the richest remote multimedia experience. Manage multiple MultiPoint Servers from a single location. Great for labs and libraries where there are a large number of stations needing multiple MultiPoint Server host computers, MultiPoint Server can now discover and manage these multiple computers from a single MultiPoint Manager User Interface. Provide even more access to students by turning one monitor into two separate stations. With larger monitors, simply connect two keyboards and mice and have two students working on one monitor independently or collaboratively. Integrate Windows MultiPoint Server with your existing Active Directory infrastructure through Domain Join. By joining your Windows MultiPoint Server to your Active Directory Domain, you can leverage your existing user names, passwords and groups on your MultiPoint Server as well as apply Active Directory enabled features such as group policy and roaming profiles to your Windows MultiPoint Server. Windows MultiPoint Server supports running with a Virtual Machine, which enables the benefits of Server consolidation, increased mobility, and easier backup.